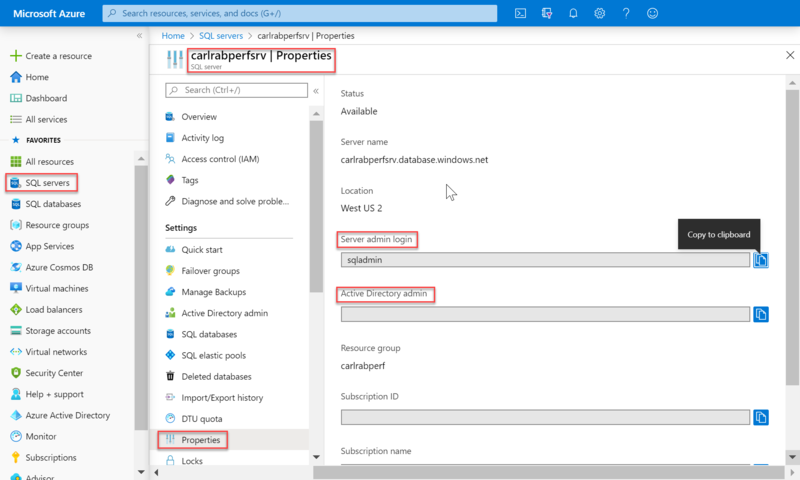 After firewall rules configuration, you can connect to Azure SQL Database and SQL Data Warehouse as one of the administrator accounts, as the database owner, or as a database user in the database. This topic applies to Azure SQL server, and to SQL Database and SQL Data Warehouse databases created on the Azure SQL server. For simplicity, SQL Database is used when referring to both SQL Database and SQL Data Warehouse. For a tutorial, see Secure your Azure SQL Database. This tutorial does not apply to Azure SQL Database Managed Instance. There are two administrative accounts (Server admin and Active Directory admin) that act as administrators. To identify these administrator accounts for your SQL server, open the Azure portal, and navigate to the Properties tab of your SQL server or SQL Database. When you create an Azure SQL server, you must designate a Server admin login. SQL server creates that account as a login in the master database. This account connects using SQL Server authentication (user name and password). Only one of these accounts can exist. To reset the password for the server admin, go to the Azure portal, click SQL Servers, select the server from the list, and then click Reset Password. One Azure Active Directory account, either an individual or security group account, can also be configured as an administrator. It is optional to configure an Azure AD administrator, but an Azure AD administrator must be configured if you want to use Azure AD accounts to connect to SQL Database. For more information about configuring Azure Active Directory access, see Connecting to SQL Database or SQL Data Warehouse By Using Azure Active Directory Authentication and SSMS support for Azure AD MFA with SQL Database and SQL Data Warehouse. Do not enter the master database as the dbo user, and have limited permissions in master. Are not members of the standard SQL Server sysadmin fixed server role, which is not available in SQL database. Can create, alter, and drop databases, logins, users in master, and server-level IP firewall rules. Can add and remove members to the dbmanager and loginmanager roles. Can view the sys.sql_logins system table. When the server-level firewall is configured for an individual IP address or range, the SQL server admin and the Azure Active Directory admin can connect to the master database and all the user databases. The initial server-level firewall can be configured through the Azure portal, using PowerShell or using the REST API. Once a connection is made, additional server-level IP firewall rules can also be configured by using Transact-SQL. When the server-level firewall is properly configured, the SQL server admin and the Azure Active Directory admin can connect using client tools such as SQL Server Management Studio or SQL Server Data Tools. Only the latest tools provide all the features and capabilities. The following diagram shows a typical configuration for the two administrator accounts. When using an open port in the server-level firewall, administrators can connect to any SQL Database. For a walk-through of creating a server, a database, server-level IP firewall rules, and using SQL Server Management Studio to query a database, see Get started with Azure SQL Database servers, databases, and firewall rules by using the Azure portal and SQL Server Management Studio. It is recommended that you always use the latest version of Management Studio to remain synchronized with updates to Microsoft Azure and SQL Database. Update SQL Server Management Studio. This section does not apply to Azure SQL Database Managed Instance as these roles are specific to Azure SQL Database. In addition to the server-level administrative roles discussed previously, SQL Database provides two restricted administrative roles in the master database to which user accounts can be added that grant permissions to either create databases or manage logins. One of these administrative roles is the dbmanager role. Members of this role can create new databases. To use this role, you create a user in the master database and then add the user to the dbmanager database role. 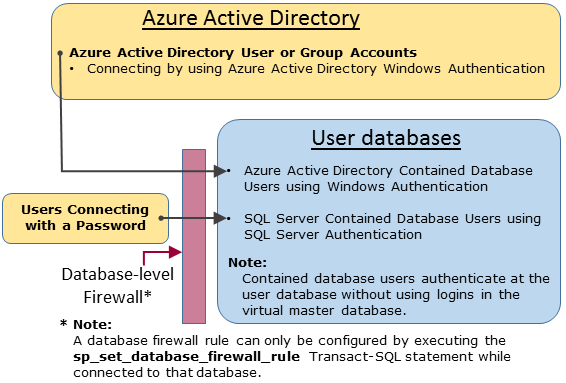 To create a database, the user must be a user based on a SQL Server login in the master database or contained database user based on an Azure Active Directory user. Using an administrator account, connect to the master database. Use a strong password when creating a login or contained database user. For more information, see Strong Passwords. To improve performance, logins (server-level principals) are temporarily cached at the database level. To refresh the authentication cache, see DBCC FLUSHAUTHCACHE. The dbmanager is a database role in master database so you can only add a database user to the dbmanager role. You cannot add a server-level login to database-level role. Now the user can connect to the master database and can create new databases. The account creating the database becomes the owner of the database. The other administrative role is the login manager role. Members of this role can create new logins in the master database. If you wish, you can complete the same steps (create a login and user, and add a user to the loginmanager role) to enable a user to create new logins in the master. Usually logins are not necessary as Microsoft recommends using contained database users, which authenticate at the database-level instead of using users based on logins. For more information, see Contained Database Users - Making Your Database Portable. Generally, non-administrator accounts do not need access to the master database. Create contained database users at the database level using the CREATE USER (Transact-SQL) statement. 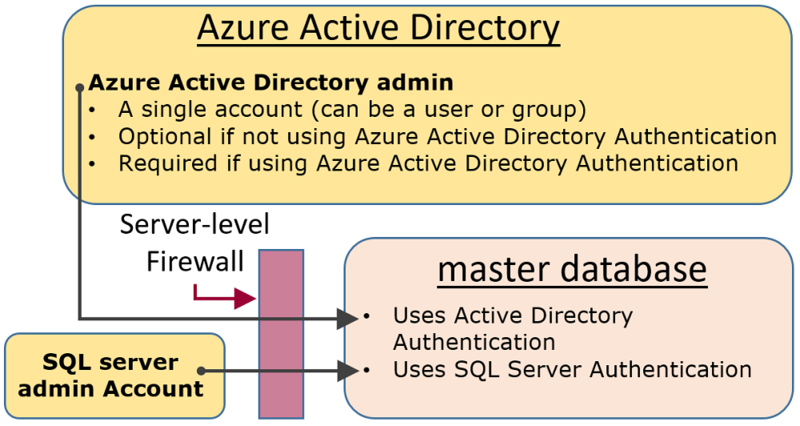 The user can be an Azure Active Directory authentication contained database user (if you have configured your environment for Azure AD authentication), or a SQL Server authentication contained database user, or a SQL Server authentication user based on a SQL Server authentication login (created in the previous step.) For more information, see Contained Database Users - Making Your Database Portable. To give additional users full control of the database, make them a member of the db_owner fixed database role. In Azure SQL Database use the ALTER ROLE statement. In Azure SQL Data Warehouse use EXEC sp_addrolemember. One common reason to create a database user based on a SQL Database server login is for users that need access to multiple databases. Since contained database users are individual entities, each database maintains its own user and its own password. This can cause overhead as the user must then remember each password for each database, and it can become untenable when having to change multiple passwords for many databases. However, when using SQL Server Logins and high availability (active geo-replication and failover groups), the SQL Server logins must be set manually at each server. Otherwise, the database user will no longer be mapped to the server login after a failover occurs, and will not be able to access the database post failover. For more information on configuring logins for geo-replication, please see Configure and manage Azure SQL Database security for geo-restore or failover. As a best practice, non-administrator users should only have access through the firewall to the databases that they use. Instead of authorizing their IP addresses through the server-level firewall and giving them access to all databases, use the sp_set_database_firewall_rule statement to configure the database-level firewall. The database-level firewall cannot be configured by using the portal. When the database-level firewall is properly configured, the database users can connect using client tools such as SQL Server Management Studio or SQL Server Data Tools. Only the latest tools provide all the features and capabilities. The following diagram shows a typical non-administrator access path. Efficient access management uses permissions assigned to groups and roles instead of individual users. When using Azure Active Directory authentication, put Azure Active Directory users into an Azure Active Directory group. Create a contained database user for the group. Place one or more database users into a database role and then assign permissions to the database role. When using SQL Server authentication, create contained database users in the database. Place one or more database users into a database role and then assign permissions to the database role. The database roles can be the built-in roles such as db_owner, db_ddladmin, db_datawriter, db_datareader, db_denydatawriter, and db_denydatareader. db_owner is commonly used to grant full permission to only a few users. The other fixed database roles are useful for getting a simple database in development quickly, but are not recommended for most production databases. For example, the db_datareader fixed database role grants read access to every table in the database, which is usually more than is strictly necessary. It is far better to use the CREATE ROLE statement to create your own user-defined database roles and carefully grant each role the least permissions necessary for the business need. When a user is a member of multiple roles, they aggregate the permissions of them all. 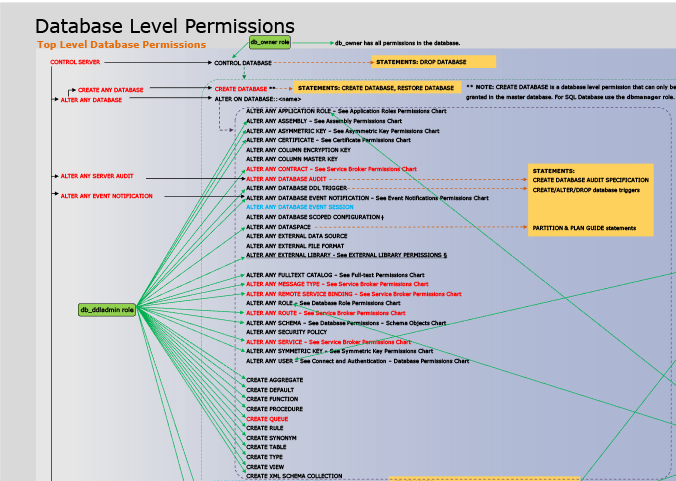 There are over 100 permissions that can be individually granted or denied in SQL Database. Many of these permissions are nested. For example, the UPDATE permission on a schema includes the UPDATE permission on each table within that schema. As in most permission systems, the denial of a permission overrides a grant. Because of the nested nature and the number of permissions, it can take careful study to design an appropriate permission system to properly protect your database. Start with the list of permissions at Permissions (Database Engine) and review the poster size graphic of the permissions. You must be connected to the master database when executing the CREATE/ALTER/DROP DATABASE statements. US-English is the default language of the Server admin login. Only the administrators (Server admin login or Azure AD administrator) and the members of the dbmanager database role in the master database have permission to execute the CREATE DATABASE and DROP DATABASE statements. You must be connected to the master database when executing the CREATE/ALTER/DROP LOGIN statements. However using logins is discouraged. Use contained database users instead. To connect to a user database, you must provide the name of the database in the connection string. Only the server-level principal login and the members of the loginmanager database role in the master database have permission to execute the CREATE LOGIN, ALTER LOGIN, and DROP LOGIN statements. When executing the CREATE/ALTER/DROP LOGIN and CREATE/ALTER/DROP DATABASE statements in an ADO.NET application, using parameterized commands is not allowed. For more information, see Commands and Parameters. When executing the CREATE/ALTER/DROP DATABASE and CREATE/ALTER/DROP LOGIN statements, each of these statements must be the only statement in a Transact-SQL batch. Otherwise, an error occurs. For example, the following Transact-SQL checks whether the database exists. If it exists, a DROP DATABASE statement is called to remove the database. Because the DROP DATABASE statement is not the only statement in the batch, executing the following Transact-SQL statement results in an error. When executing the CREATE USER statement with the FOR/FROM LOGIN option, it must be the only statement in a Transact-SQL batch. When executing the ALTER USER statement with the WITH LOGIN option, it must be the only statement in a Transact-SQL batch. To CREATE/ALTER/DROP a user requires the ALTER ANY USER permission on the database. When the owner of a database role tries to add or remove another database user to or from that database role, the following error may occur: User or role 'Name' does not exist in this database. This error occurs because the user is not visible to the owner. To resolve this issue, grant the role owner the VIEW DEFINITION permission on the user. To learn more about firewall rules, see Azure SQL Database Firewall. For an overview of all the SQL Database security features, see SQL security overview. For a tutorial, see Secure your Azure SQL Database.